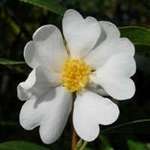 The small, flat, single white flowers have heart-shaped petals and are very fragrant. The leaves are relatively small with a coarse, leathery texture. Upright growth, eventually forming a small tree of about 3-4m high. Flowers January to March. Small, flat, single white flowers. Coarse foliage. Upright growth, to about 3-4m high. Good quality plant, arrived very quickly and was well packaged. A very good nursery to deal with. This is a "must have" for any collection ! Lots of flowers and strange leaves, this is outstanding. Received a very nice plant with both flowers and buds. Excellent packed and arrived on time.